Right now we are waiting for new Ian ELLIOT Seascape Art to arrive at the gallery. In the meantime, here is a wider selection of the artist's work featured at the Red Rag Scottish Gallery. Ian Elliot was born in Glasgow in 1946. Elliot's talent as a young Scottish artist were evident at an early age. He won gold and bronze medals for art on four successive occasions before attending and graduating from the Glasgow School of Art in 1964. Like a many of today's successful Scottish contemporary artists, Ian Elliot, left the Glasgow School of Art and took up a career teaching modern art. Elliot eventually became Head of Modern Art at a large Glasgow school. Then after some years Ian decided to focus full time on painting contemporary art. 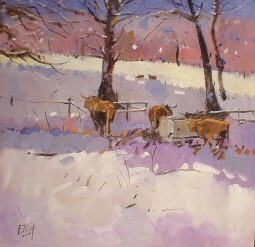 Since becoming a full time artist in 1997 Ian Elliot has quickly established a reputation as a popular modern Scottish artist. Ian's contemporary paintings are now collected by British and Scottish art enthusiasts and by collectors in Eire, Germany, Spain, Canada and the USA. In 2003 Ian Elliot's art work appeared in the prestigious International Artist magazine as one of ten finalists in their (global) landscape competition, and more recently in a ten page feature article. Ian's work can also be seen on Tartan2 CV calendars and greetings cards. Ian Elliot now visits, and gains much inspiration from, the island of Mallorca and from Italy and France, sharply contrasting environments from that of his native shores. Travelling extensively in Spain, Italy and France has developed an endless fascination for Ian with the Mediterranean countryside and the Island of Mallorca. He is known for incorporating the strong colours of the Mediterranean in all his landscapes and seascapes creating a fusion of shimmering colours, distinctive buildings of the land, and abstract expressionistic vistas. Ian Elliot also travels extensively throughout Scotland. He is fascinated by the visual imagery of the Scottish landscape and produces paintings of movement, colour, rhythm and pattern many of which are inspired by visits to the Scottish farmlands. In addition to Red Rag Scottish Art Gallery Ian Elliot art work has been exhibited at other leading Scottish Art Galleries. Each painting at Red Rag is sourced from the Ian Elliot artist studio and like all Red Rag Scottish art and Contemporary art it can be shipped worldwide. This is the Seascape art page from Red Rag Scottish Art Gallery featuring the best in contemporary Scottish art. Throughout the year Red Rag features Scottish art from artists who specialise in creating fine Seascape paintings. Today is no exception you will find Red Rag Scottish Art Gallery has an extensive collection of Seascape art and paintings by leading contemporary artists. As a country with an extensive coastline, paintings of seascapes have always had a special attraction to Scottish artists. All the seascape paintings at Red Rag showcase the talent of Scottish painters and their ability to depict changing light on water and rapidly altering climatic conditions. Many of the Scottish artists who have painted these seascape paintings are also talented landscape painters, or worked in other genres as well as seascapes, such as still life or portraiture.